If you do not like tales of hunting (even if it is just killing a few of the thousands of rodents intent on destroying a wheat farm), then just skip on by this post and come back tomorrow! While we were on our Montana trip, we enjoyed a visit to a wheat farm! This is not just any farm - it's the farm where my Dad grew up; the farm that his parents homesteaded; the farm that my cousin currently operates. We had a great time going to see it and my cousin drove us all over showing us various things. Of course he took a gun along so we could shoot some gophers (a regular occurrence as they're all over the place, including right in the middle of the wheat!) to help him out. We decided to let my son try even though he's never really shot an actual gun. 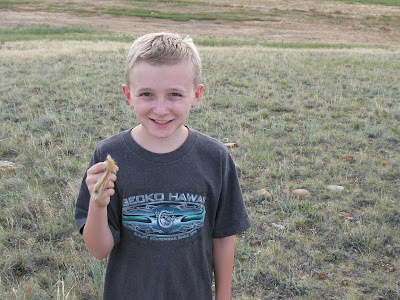 He shot 2 gophers in his first 2 shots - no misses and they were not close! So we have now named him "The Gopher Slayer" and he is available for hire if you need one - LOL! We were in Montana visiting my Grandpa. We went out to visit my cousin once removed on his farm. 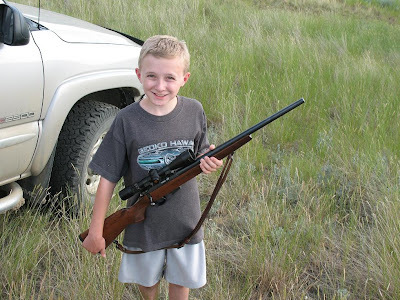 We went out to shoot gophers and we saw one when we were in the truck and I wanted to shoot it. My Dad handed me a gun to shoot it with. I pointed the gun out of the window and aimed at the gopher. I shot at it and hit it. Later we saw another one, we got out of the truck and my Dad handed me the gun. I aimed at the gopher and shot it. And we cut the tails off of them. I had fun. I liked shooting a gun. I did spare you the pic we took of one of the dead gophers as I just don't think it goes well with all the pics of chocolate and tea around here - you're welcome! Have a blessed day and hope to see you here tomorrow - I'll probably have another trip post! Big my gopher was bigger than your gopher size hugs to you! Well... I can not read your blog anymore... talk of killing animals. My son would be horrified! Just kidding of course (except on how my son would feel). Good shooting kid! P.S....thanks for sparing us the gory dead gopher pic, LOL. I like his take on the situation! My son would like you to email a pic of the gopher. He likes your son's writing style. Thinks he should be a writer. You know mine's planning to be a journalist. He's never really shot before, but he hit two gophers right off the bat? I'm impressed! I hope my girls can learn to shoot half so well!